Five years since its establishment, the ASEAN Intergovernmental Commission on Human Rights (AICHR) is yet to adequately act as a full-fledged regional human rights body that is on par with its peers in Africa and the Americas. AICHR has continued to be reluctant to work independently and take initiatives as a regional body. Decision-making within the body is governed by a consensus rule, which has prevented action on important ongoing human rights situations in ASEAN member states. In addition to this AICHR’s appointment process for its commissioners ensures that most commissioners are directly answerable to their governments for their actions leaving them incapable of acting as a group of independent experts. Furthermore when in action, AICHR has shied away from applying universally accepted human rights law and standards. Many such problems stem from AICHR’s 2009 Terms of Reference (ToR). The ToR establishes AICHR as a “consultative” body, embodies the principle of “non-interference in the internal affairs of ASEAN Member States,” and provides a limited protection mandate while failing to regulate or encourage relationships with other human rights bodies and stakeholders, including civil society organisations. Article 9.6 of the ToR provides for a review of the ToR five years after its entry into force, “with the view of further enhancing the promotion and protection of human rights in ASEAN.” So far, the process has just consisted of one consultation with other ASEAN bodies and one with civil society organisations. A further round of consultations is planned late this month. In July this year, AICHR plans to present its recommendations to the ASEAN Foreign Ministers Meeting (AMM). It is not clear at this point what form these recommendations will take – there is no indication of whether this will include a clear revised draft text of the ToR or be limited to general comments. It is also not clear how the Foreign Ministers will take the process forward after July. The ToR review process offers a unique opportunity to strengthen AICHR into an independent body that is grounded in universally recognised human rights law and standards. To make the AICHR a credible regional human rights organisation on par with similar organisations in other regions, FORUM-ASIA believes that it is important to build advocacy and awareness among all stakeholders at the national regional and international levels. In this regard, support from the international human rights community, particularly at the UN, is necessary for moving the review of the TOR in a positive direction. From 2011 to 2012 the international community and UN human rights mechanisms contributed meaningfully to AICHR’s efforts in drafting the ASEAN Human Rights Declaration. In particular, the UN High Commissioner for Human Rights, Madam Navanethem Pillay, made a compelling case for AICHR and to ASEAN leaders to uphold international law and standards in the Declaration. 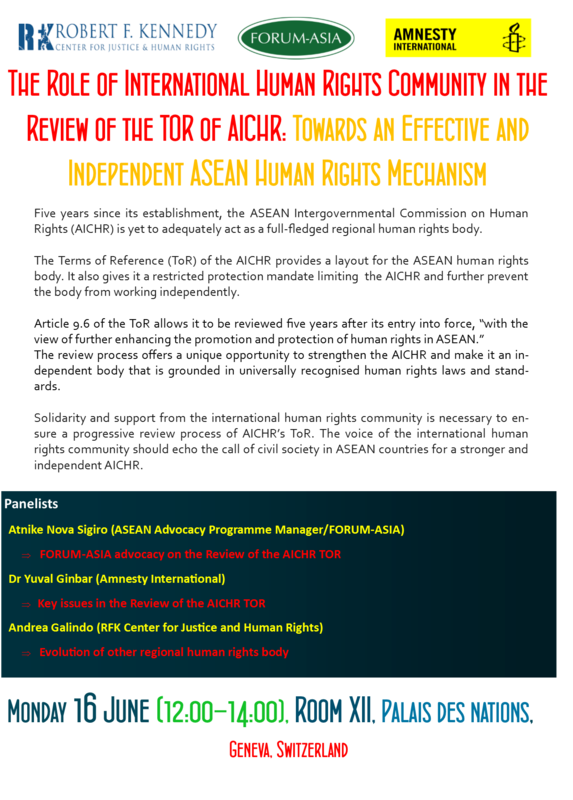 FORUM-ASIA calls for solidarity and support from the international human rights community at the 26th UN Human Rights Council in supporting a progressive review process of the AICHR ToR. The voice of the international human rights community should echo the call of national civil society in ASEAN countries for a stronger AICHR. AICHR plans to hold its 2nd regional consultation on the review of its ToR from 27-28 June 2014 in Bangkok. At this second consultation, AICHR will invite international human rights experts, members of other regional human rights mechanism, and the OHCHR. The international human rights community must use this opportunity to highlight the importance of a revised TOR that will strengthen AICHR, make it independent and ensure it can actively address human rights violations and situations based on universal human right law and standards. To strengthen international support, particularly by member states of the UN HRC, as well as OHCHR, to an inclusive, progressive and forward-looking review of the AICHR ToR.